The iPhone 4 has shown that hand effect problems can be very serious. This is generally true of antenna problems, I know of several handsets that were developed at huge cost and never shipped because satisfactory antenna performance couldn’t be achieved. The Industrial Design direction. Some IDs are easier for antenna designers to work with than others. The Antenna Type – an antenna type can be picked that is more resistant to problems. Antenna placement – where in the handset the antenna is. Details of Antenna Design – just as some antenna types are better some features within antennas can be better or worse. Radio influences such as the radio and the band support can help. If the industrial designers and the antenna designers are prepared to be cooperative then that can help a lot. The industrial designers should to be flexible about the type and layout of the antenna. The antenna designers for their part should not try to build the easiest type of antenna possible, they should aide the industrial designers in achieving a good design. Generally the more cubic centimeters of space that are apportioned to the antenna the better the performance that the antenna designers can achieve on every spec. But, there are often more elegant ways to solve the problems than throwing CCs of space at them. In some situations the industrial designer can design a case that encourages the user to hold the handset in a particular way. The case can encourage the user not to hold the antenna. For example, if there’s a bump around the rear-facing camera then the user is less likely to wrap their hand around it and the area above it. Externals are rarely an issue these days, but they teach important lessons for internal antenna design. A retractable whip antenna is an external monopole that is parallel to groundplane and above it. The other main type of external is the stubby, these are a small round cylinder of plastic containing a type of shortened monopole antenna. Often stubby antennas are called “helicals” in books because it’s assumed that the antenna inside is a normal mode helix. Often though designers used other shapes, such as meanders. Anyway, both meanders and normal mode helicals are shortened monopole antennas. So, the two main types of external antenna, the retractable and the stubby are respectively a monopole and a shortened monopole. Investigations into these antennas years ago showed that the stubby antenna suffers more from the effects of the nearby head than the retractable. The reason for this is quite clear if you imagine a person holding a phone with both types of antenna. Part of the retractable antenna is close to the head, but all of the stubby antenna is close to the head. By compressing the antenna into a small space the stubby antenna creates a small space where the nearby dielectric materials have a large effect. So, stubbys suffer seriously from detuning problems, this problem carries over into internal antennas. Internal antennas are often all called “PIFAs”, but the word is used for types of antenna that are really quite different to each other. Since PIFA means “planar inverted-F antenna” some people use it to refer to any antenna that has a feed and short pin that is made out of flat conductors. There are really at least two types though, firstly there are the sort built on top of a groundplane, those are somewhat like size-reduced patch antennas. Then there are the sort where the groundplane is parallel to the antenna but not underneath it, those are more like size-reduced monopole antennas. The diagram below is a side view of the internals of two handsets. The PCB material is in green and the groundplane is in orange. The type with the groundplane underneath is what’s normally called a PIFA. The type with no groundplane underneath is closer to a monopole, even if it has a ground pin that only really affects the matching. Some types of normal mode helix have ground pins too. These two types of antenna have their advantages and disadvantages, it’s worth mentioning them all not only those connected with the hand & head effect problems. Components can be put in the side of the opposite side of the groundplane to the antenna, and sometimes on the antenna side too. With many types of design radiation is directed away from the head especially in the high frequency bands. It’s not that difficult to meet SAR specifications. Dielectric objects, such as the head, don’t detune the antenna much if they’re behind the groundplane. Since that side of the groundplane doesn’t transmit much radiation blocking it with an absorbing object doesn’t cause that much signal to be wasted. Generally require a lot of volume. 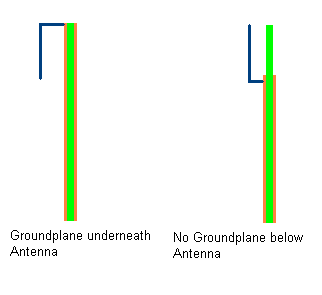 The distance from the antenna to the groundplane is critical. That gap must be large for a multi-band antenna. But, the size of that gap directly affects the thickness of the handset. Generally require less volume than with-groundplane antennas. A bit easier to design. A multi-bands antenna doesn’t require a thick handset. The PCB area around the antenna can’t be used. Other types of metal components often can’t be placed nearby because they cause detuning. The antenna detunes when a dielectric object is placed nearby at any side. The head causes more detuning compared to an antenna with a groundplane, and the hand generally does too. If the antenna is close to the head in the normal call position then the handset will probably fail the SAR tests. The main lesson here is if you want the antenna to perform well in the presence of the head and hand then use an antenna with a groundplane. The conventional type of handset antennas I’ve discussed here only work well if they’re at the top of the handset or the bottom. They don’t work well in the centre of the PCB. So, the choice is between the top and bottom. Generally users hold their phones by the bottom part, so hand detuning is worse if the antenna is at a the bottom. Sometimes the ID designers can help here by creating a case that encourages the user to grip the phone in a different way, but that’s difficult. Similarly, head detuning is generally worse if the antenna is at the top of the handset. PIFAs with groundplanes below can be put at the top or bottom of a handset. If they’re put at the bottom then the user is likely to cover the antenna with their hand and cause serious attenuation and detuning. If the antenna is put at the top then the head is on the groundplane side not the antenna side, so it causes less detuning. So, this type of antenna should be put at the top. The situation is different for antennas with no groundplane below them. These will generally fail the SAR test if they’re put at the top, so they have to be put at the bottom for that reason. This means that these type of antennas have a two-fold problem. They are sensitive to detuning by dielectric objects and since they generally have to be put at the bottom of the handset they are more likely to be close to the hand or even covered by it. The main lesson here is to use a PIFA with a groundplane and put it at the top if you can. The situation for slide handsets and clamshell handsets is quite complicated, I might discuss that in the future in another post. 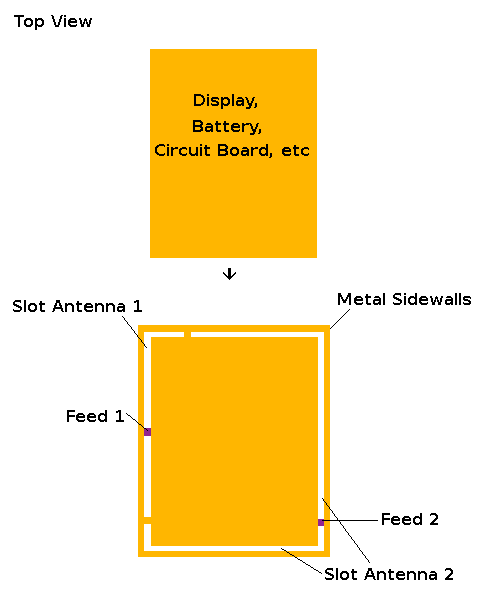 Details of the Antenna Design. The closer the antenna is to the outside of the case the more it will be affected by proximity detuning. But, if the designer leaves a gap between the case and the antenna then that’s forsaking space and it will probably decrease the antenna’s performance in empty space. This trade-off has to be made on a handset-by-handset basis. It’s difficult and can require a lot of prototyping and simulation. Another problem is areas of high E-field. Generally the sensitive parts of an antenna follow the E-field. If the E-field is high in a particular region then a dielectric object close to that place will cause a large frequency shift. It’s best to avoid creating such regions as much as possible, that can be done by widening out conductors on the antenna close to the high E-field region. Another possibility is to move the region further inside the handset. There have generally been two theories about the iPhone 4’s problem. Firstly, lots of people online have said that dampness on the users fingers causes a conductive bridge over the gap in the case. As I said in previous posts I don’t think that’s very likely. Secondly, when the user touchs the gap that causes detuning. I think the detuning explanation is more likely, but the conduction explanation could be right, or it could be a bit of both. In either case this demonstrates a problem with putting the antenna on the outside of the case. If GPS, Bluetooth or WLAN antenna is needed then it’s best to use a separate antenna for those bands. That helps the detuning problem because it makes the main antenna design easier. Other Influences such as the Radio. The output amplifiers in the transmitter part of the radio suffer from the problem of “load-pull”. The amplifier is built to work when applied to a particular output impedance which is generally 50 ohms. If the antenna’s input impedance is different than 50 ohms then there is mismatch loss. But, there’s also an additional loss caused because the amplifier’s performance degrades, this is load-pull. Suppose due to detuning the VSWR on a particular channel gets worse, it goes from 3:1 to 2:1. The amplifer may not be able to supply full power when mismatched 2:1, so it’s power output may drop by a dBm or two. That would cause a big drop in performance. So, an amplifier with better load pull characteristics gives better performance when there’s detuning. This was a great problem in the early days of digital cellular in the 90s and early 00s, amplifiers then had much worse load-pull characteristics than those we have today. But, the problem has never completely gone away. (Exactly why it’s never gone away is a story for another time). I’ve seen a few folks try to redesign the matching circuit to cope with detuning better. I’ve never seen this enterprise succeed though. I don’t think there’s much that matching circuits can do to overcome this problem. ESD protection circuits are important if metal parts of the antenna are exposed to the user. The radio must be protected from static shocks that can occur if the user accumulates a charge by walking across a carpet for example. Cellphones today cover many bands. A cheap European handset will cover the European GSM/EDGE bands at 900MHz and 1800MHz, the US PCS band at 1900MHz and the European WCDMA/UMTS band at 2100MHz. A cheap US handset will cover the US 800MHz and 1900MHz bands, GPS at 1575MHz and often the European 1800MHz band too. But, these handsets don’t compare to high-end Smartphones, those often support all of the bands I’ve mentioned above, that’s six bands. Such phones are called “world phones” because they support so many bands that they can be used almost anywhere there is a cellular network. Supporting all those bands requires a large antenna especially if a PIFA with a groundplane below it is used. This often results in detuning taking a back-seat in antenna design because band support becomes the big issue. This problem can be solved by regional variants. The makers of cheaper handsets tend to make a US version and a European version. Most countries use the US or European band layout, so doing that provides a large market. These phones will still work if taken abroad because there is provision for that. For example, a typical European handset will work on the 1900MHz PCS band in the US, assuming the carriers involved have agreements. If Smartphone designers were to take this approach then they would have to build more handset variants, but it would make the antenna less difficult. It would make with-groundplane PIFAs more practical and they were used that would help prevent detuning. If handset designers paid a little bit more attention to the issues above then the user experience would be better. From the user’s point of view “network coverage” would magically increase. But, users mostly blame networks for poor coverage rather than handsets. That means the handset companies often have little incentive to improve. But, after the well-publicised iPhone 4 problems users may be more critical of handsets in the future. Apple showed a group of journalists around their Anechoic Chamber facilities. There are articles about the visit at Engadget, Macworld, New York Times and Techcrunch. Normal folks can learn a little from those articles about how antenna design is done. Antenna folks can get jealous and wish they had access to so many chamber. Most large wireless companies have similar facilities, though most are not anything like as big. The photos show an ETS tapered chamber and a Satimo SG chamber. I commissioned an ETS 8600 in a previous job. I don’t know what type the enormous cylindrical chamber pictured at the start of the New York Times article is. I’ve never seen a chamber like that before. It seems to have a series of range antennas in a ring around the wall. At a press conference today Apple have agreed to give iPhone 4 customers “bumpers” to ameliorate the antenna performance issue. They have also agreed that customers can return their phones and contracts if they aren’t happy. I think this is a good strategy it shows consideration for the customer. Steve Jobs showed that other phones suffer from similar signal strength issues. He demonstrated some other phones losing bars when held, he used the Droid Eris (called the HTC Hero in Europe), Blackberry Bold 9700 and Samsung Omnia II. See this article. Certainly other phones do suffer from this problem, as I wrote earlier. But, the experiment shown doesn’t really demonstrate that all these other phones suffer from the problem to the extent that the iPhone does. As I mentioned previously there is no standard for signal strength reporting. Some manufacturers are quite conservative about it, some less so. A signal strength one phone displays as three bars another may display as one bar even though the two phones have similar performance. Secondly, it is unlikely that the demonstration relied on a normal base-station. It’s unlikely that the space for the press conference is in a low-signal area. So, I expect Apple simulated the condition by using a base-station simulator. That’s perfectly legitimate and I would have done it too. But, it allows the channel selected to be picked for the demo. Apple could have gone through the hundreds of channels for WCDMA and EDGE that those three phones support. They could then have picked the channels that are affected the worst by hand detuning and used those. Lastly, the three phones could have been selected because they suffer particularly badly from hand detuning. I don’t know that Apple have done any of this sort of gaming of the test. But, they could have done it. What Jobs has shown doesn’t prove much. Spencer Webb at AntennaSys has written a good post on the iPhone antenna problems. What’s he’s said about detuning and attenuation is very similar to what I’ve said in other posts. I doubt this is because he reads my blog, it’s more likely because we’ve both had similar experience with handsets before and know many of the same things. I have been thinking about this more though, and there is a possible explanation for why damp hands may cause the problem. As I said earlier at GHz frequencies damp hands don’t conduct well. But, what if the problem is at much lower frequencies? It could be that the WLAN/BT/GPS antenna is polluted with low frequency interference in the KHz or MHz region. Then, when the user puts a damp finger over the gap that interference is conducted to the cellular antenna. This would only cause a problem if the cellular antenna radio were sensitive to the low frequency interference, that shouldn’t happen but it could happen if mistakes in the design were made. That would be a very odd cause though, I still think detuning is more likely. Since Apple have started saying the problem with the iPhone is caused by signal strength bars folks have become interested in that. Carl Bialik at the WSJ has written two interesting articles about signal strength bars and their problems. Here and here. Apple are claiming that the problem with the iPhone 4 is only down to the signal strength display. But, many users have demonstrated that the drop in signal strength affects both data throughput and can cause dropped calls. As I mentioned yesterday Anandtech have measured the signal strength drop and found that it’s very large. Upon investigation, we were stunned to find that the formula we use to calculate how many bars of signal strength to display is totally wrong. Our formula, in many instances, mistakenly displays two more bars than it should for a given signal strength. For example, we sometimes display four bars when we should be displaying as few as two bars. This does make some sense. The users affected may be in poor signal areas that are being reported as good signal areas. So, the degradation is exaggerated. However, that doesn’t show that Anandtech or the other testers are wrong. Anandtech’s test didn’t depend on the bar display, they used a piece of software that extracts the signal strength in dB from the radio. Also, the problem is reported to affect both WCDMA(3G) and GSM EDGE. The signal levels involved in these two protocols are quite different. The algorithm or formula that takes signal strength information (and sometimes other info) and produces the display of signal strength bars is generally different. That is, WCDMA has an algorithm to produce the bar display and EDGE has a different algorithm. The folks at Anandtech have hacked an iPhone 4 to produce a signal strength indication in dB. They’ve then experimented to find the signal strength drop when the phone is held in various orientations. See the article here. Since they’ve measured this with a normal network in a real-world environment I don’t expect that the results will be very accurate. The propagation path between the test site and the nearest base-station will sometimes change. However, the measurements give a ball-park idea of what the drop in signal is like. If the handset is “cupped tightly” the drop in signal-strength is 24.6dB, it it’s “held naturally” the drop is 19.8dB. One of the handsets they compare it with is the Nexus One. Interestingly the Nexus One doesn’t do too well either. What Could Apple do to Fix the iPhone 4 Performance Issues? A few folks have asked me what Apple could to to fix the problems. As I wrote in earlier posts I think this is an antenna issue, that makes software fixes unlikely. It may be that the problem has a software component. For example, the signal strength bar display could be exaggerating the problem. There may be a way to redesign the antenna to remove the problem without changing it much. In my opinion the dielectric properties of the hand are changing the capacitance between the metal bands on either side of the slot. That capacitance might not be a necessary part of the design. In that case it may be possible to solve the problem by making the plastic gap wider, that would reduce the capacitance in any scenario. If the capacitance is necessary though then things become more complex. It may be possible to move the sensitive area a little into the inside of the handset. Now the internet is abuzz with discussion of reception problems that have been found with the iPhone 4. Many are blaming the new antenna design. I don’t know for certain what the problem is, but I can make some informed speculation. Customers who have bought the iPhone have noticed that when they touch a certain place then the reception gets much worse. That place is the small band of plastic in the out metal sidewall on the bottom left. This video isn’t me, but it’s one of the better videos demonstrating the problem on the net. It’s quite true that other phones suffer from similar problems. There are now several videos on the internet showing the signal strength report on various phones deteriorating when they are held. This has been shown using old Nokia phones, Blackberries and earlier iPhones. This is a well known problem. The important question though is: does the iPhone 4 suffer from it *more* than other handsets? In my opinion from the evidence available online the answer to that question is “Yes”. The human hand contains a lot of water and other materials which absorb EM waves. It is also strongly dielectric, muscle has a dielectric constant of ~56. So, any capacitive effects are strengthened by the presence of the hand. Both of these have an effect on antenna performance. Suppose you cover over the antenna on your handset with your hand. Because of the absorbtion less radiation reaches the basestation. Also, the antenna contains distributed capacitance, this capacitance is increased by the dielectric properties of the hand, the antenna become more dielectrically loaded. The antenna has been tuned to work at the design frequencies with the normal capacitances. This disturbance causes “detuning” and the performance of the antenna reduces at frequencies bands it was designed for. Often there is a frequency shift and the antenna’s bands of good performance move up in frequency or down. People talk a lot about the absorption effect, but in practical cases the dielectric effect is often more important. The magnitude of this problem was measured by G.F.Pedersen in several papers that comprise his PhD thesis. Pedersen got many people to hold a mobile phone like they would in a phone call and measured it’s performance as they held it, to find out the loss caused by the proximity of the head and hand. He collected the data for several types of antenna, including an internal PIFA antenna mounted at the top of the handset. Pedersen’s measurements show a great range of performance depending on how the specific characteristics of the user, such as how they hold the phone, the size of their head, etc. He found that for the PIFA antenna the average degradation was ~3dB. In the past I’ve found that modern handsets with internal PIFA antennas close to the top are a little worse than the one Pedersen used, but not much worse, I’d estimate the loss at 3 – 6dB. Those with PIFA antennas at the bottom are worse because because the user tends to cover over the antenna with their hand. I don’t have an estimate for the loss in that case. The iPhone 4 doesn’t report the signal strength in dBs. Like most phones, it indicates it to the user by showing “strength bars”. At present nobody outside Apple knows how those strength bars work. The may include data other than strength too, such as signal to noise ratio. However, the various videos in the internet do show the signal strength dropping from 5-bars down to no-signal. Normally when a phone gives “full-bars” that means it’s receiving at least 10dB more than the minimum it can cope with. Often full-bars means that the phone is receiving 20dB more than the minimum. This indicates that the performance degradation for the iPhone 4 is especially bad. I can’t be sure of that, but that’s my view from the available evidence. There are several ways that this problem could occur. Firstly, the loss introduced by placing a hand around the phone may be especially high. I don’t think this is likely because there have been demonstrations on the internet that show the problem is associated with a particular area on the phone. If the plastic band at the bottom left is touched then the performance deteriorates. The most likely explanation for this is associated with dielectric properties. If there is a lot of fringing capacitance between the two pieces of metal at either side of the gap then placing a dielectric object – such as a finger – across the slot will radically change the capacitance. That it turn will change detune the antenna and reduce the performance in some bands. Some folks have suggested that the problem could be due to conductivity. They’ve suggested that the moisture on people’s fingers may cause a current path between the two pieces of metal. This is possible, if it did happen it would certainly cause big problems. Some folks on the internet have put a coin across the gap and showed that this causes performance degradation. However, there are some videos now showing the problem occurring with iPhones in rubber and plastic cases. These cases are unlikely to conduct well at GHz frequencies, so I think the dielectric explanation is more likely. Some people aren’t reporting any problems with their iPhone. That’s not really so surprising since lots of people live in areas of high signal-strength (see my post on networks). Also, if dielectric detuning is the problem then it will not affect all bands and channels equally. It may be that some bands are entirely unaffected. So, we should expect only a subset of users to be affected. Starting with the iPhone 4 Apple have started offering a cover, called a “bumper”, for the iPhone. It’s interesting that the experiments with covers and outer cases have been inconsistent. Sometimes the cover has solved the problem, sometimes it hasn’t, sometimes it’s helped a bit. This could be because the various covers are different, some dielectrically load the critical parts of the antenna, and some don’t. Perhaps some allows the users hand close enough that it causes dielectric loading but others keep the hand further away. Lastly, an answer to something that has puzzled a few people – why does the signal strength display change so slowly? That’s because these sort of displays use averaging. They average the signal strength measurements over the last few seconds. So, even if the signal strength changes quickly the display doesn’t. This is a feature to make the display more user friends, all handsets do it. New types of antenna are being invented all the time. Existing types of antenna are constantly being adapted to new roles. But, in most cases these efforts aren’t successful, most new antennas are outperformed by existing designs. The existing well-known types of antenna have their own niches. When designers attempt to apply them outside their normal niches in other niches where other antenna types predominate this usually fails. Even if the antenna works in its new application its normally found that the type normally used in that niche can outperform it. These stories are the tails of the failure of many research programmes and start-up companies. 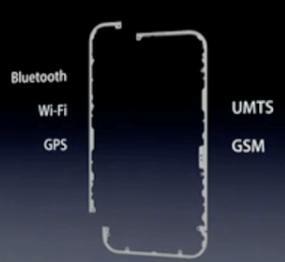 The new antenna in the iPhone 4 is surprising and impressive because it’s designers have overcome these barriers. Most new handsets use one of the common types of antennas, the monopole, the vertical helix (or stubby) antenna or the PIFA. The antenna design is almost always new for every new handset, but it’s based on an existing archetype. When a new type of antenna being developed it will normally be released first in an obscure low-volume product. This slide doesn’t make it clear what type of antenna we’re dealing with here because it doesn’t show the feeds or the ground-plane. I think I’ve figured it out though by looking through some of Apple’s patent submissions. Apple have patented a lot of antenna designs, but two patents in particular looks very like the antenna in the iPhone 4 slides and teardowns on the internet. The first is US patent application #20100123632 and the second a granted US patent #7551142 and these describe types of slot antenna. Like most patents it doesn’t describe the relevant ideas very clearly. So, I’ll explain it in my own way…. A normal slot antenna is a narrow rectangular hole cut in a large conductive surface. The slot antenna is closely related to the dipole, it is the “complement” through the Babinet-Booker principle of the dipole. There’s an analysis of slot antennas from this perspective in Kraus & Marhefka. These simple slot antennas are used in antenna arrays for radars and various other types of electrically large antennas. But, they aren’t generally used for electrically small antennas. (Some folks may know of “slotted-PIFAs” these are PIFA antennas with slots in them but they aren’t slot antennas their design is very different). Slot antennas can be dielectrically loaded by filling the slot with a dielectric material such as plastic or ceramic. The antenna may be a slot antenna having a dielectric slot opening. The slot opening may have a shape such as a U shape or an L shape in which elongated regions of the slot run parallel to the edges of the portable electronic device. The portable electronic device may have a housing with conductive sidewalls. The conductive sidewalls may help define the shape of the slot. Antenna feed arrangements may be used to feed the slot antenna in a way that excites harmonic frequencies and that supports multiband operation while being shielded from proximity effects. In the middle of phone there is a circuit board, battery, and display. All of these can be connected together, so that at RF frequencies they behave quite like a large block of conductive metal. This is common practice in handsets, as far as I can tell this is what’s being done in the iPhone 4. Around that there is a metal sidewall. The patent suggest that using a configuration like this slot antennas can formed from the gap between the metal sidewall and the internal conductive block. The diagram above shows too slots both feed slightly off centre. One runs around the top and left side of the handset and the other around the rest. There are several ways of feeding such an antenna and the patent describes some of them. The simplest is a feed between the sidewall and main chassis driving a voltage between them. In the diagram above I’ve put on feeds and places where the slots end, these are just an illustration of the principle. I don’t know for sure if Apple have used this patent, if they have I don’t know where the feeds are. The patent explains that non-conducting front and back covers can be used to conceal and protect the antennas and internal electronics. Since these are covers of a dielectric material, that means there will be some dielectric load, and the antennas will be dielectrically loaded slots. There’s lots more to talk about here. I haven’t covered much of the ideas in patent #7551142, I’ll do that in a future post. If I have time I’ll compare this to more conventional types of antennas like PIFAs. Also, I’ll comment on the problems recently uncovered with iPhone reception very soon.